USES: This combination medication is used to treat a certain type of acne (inflammatory acne vulgaris). It helps to decrease the number of acne pimples. 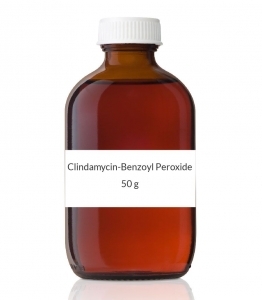 Clindamycin is an antibiotic that stops the growth of acne-causing bacteria. Benzoyl peroxide can also stop the growth of bacteria as well as reduce oil production in the skin, helping keep your pores open. HOW TO USE: Before using this medication, wash the affected skin gently with mild, non-medicated cleanser, rinse with warm water, and pat dry. Apply a thin layer of this medication to the affected areas of the skin as directed by your doctor. Be careful to avoid your eyes, mouth, inside your nose, and any areas of broken skin. Wash your hands after each use. It may take up to 6 weeks to see a decrease in acne and up to 12 weeks to see the full benefit of the medication. Tell your doctor if your condition does not improve or if it worsens. SIDE EFFECTS: Dry skin, redness, burning, itching, or skin peeling may occur. If any of these effects persist or worsen, tell your doctor or pharmacist promptly. You can use skin moisturizing creams or lotions to help reduce many of the side effects listed above. Remember that your doctor has prescribed this medication because he or she has judged that the benefit to you is greater than the risk of side effects. Many people using this medication do not have serious side effects. This medication may be absorbed into your bloodstream and very rarely cause a severe intestinal condition (Clostridium difficile-associated diarrhea) due to resistant bacteria. This condition may occur weeks after treatment has stopped. Do not use anti-diarrhea products or narcotic pain medications if you have the following symptoms because these products may make them worse. Tell your doctor immediately if you develop: persistent diarrhea, abdominal or stomach pain/cramping, blood/mucus in your stool. A very serious allergic reaction to this drug is rare. However, seek immediate medical attention if you notice any symptoms of a serious allergic reaction, including: rash, itching/swelling (especially of the face/tongue/throat), severe dizziness, trouble breathing. This is not a complete list of possible side effects. If you notice other effects not listed above, contact your doctor or pharmacist. In the US - Call your doctor for medical advice about side effects. You may report side effects to FDA at 1-800-FDA-1088. In Canada - Call your doctor for medical advice about side effects. You may report side effects to Health Canada at 1-866-234-2345. PRECAUTIONS: Before using this medication, tell your doctor or pharmacist if you are allergic to benzoyl peroxide; or to clindamycin; or to lincomycin; or if you have any other allergies. This product may contain inactive ingredients, which can cause allergic reactions or other problems. Talk to your pharmacist for more details. This medication should not be used if you have certain medical conditions. Before using this medicine, consult your doctor or pharmacist if you have: intestinal disorders (e.g., regional enteritis, ulcerative colitis, antibiotic-associated colitis, Clostridium difficile-associated diarrhea). This medication may make you more sensitive to the sun. Avoid prolonged sun exposure, tanning booths, and sunlamps. Use a sunscreen and wear protective clothing when outdoors. This medication may bleach hair or colored fabric. Avoid contact with hair or clothing. During pregnancy, this medication should be used only when clearly needed. Discuss the risks and benefits with your doctor. This drug may pass into breast milk and could have undesirable effects on a nursing infant. Consult your doctor before breast-feeding. DRUG INTERACTIONS: Your doctor or pharmacist may already be aware of any possible drug interactions and may be monitoring you for them. Do not start, stop, or change the dosage of any medicine before checking with your doctor or pharmacist first. Before using this medication, tell your doctor or pharmacist of all prescription and nonprescription/herbal products you may use, especially of: other acne medications used on the skin (e.g., products that contain erythromycin). This document does not contain all possible interactions. Therefore, before using this product, tell your doctor or pharmacist of all the products you use. Keep a list of all your medications with you, and share the list with your doctor and pharmacist. OVERDOSE: This medication may be harmful if swallowed. If swallowing/overdose is suspected, contact your local poison control center or emergency room immediately. US residents can call the US National Poison Hotline at 1-800-222-1222. Canada residents can call a provincial poison control center. STORAGE: Different brands/strengths of this medication may have different storage requirements. Read the package labeling or ask your pharmacist for the storage requirements for the product you are using. Protect from light and moisture. Keep the container tightly closed, and do not store in the bathroom. This medication is good for a limited time after you receive it. Discard any unused medication by the expiration date your pharmacist provides. Keep all medicines away from children and pets. Do not flush medications down the toilet or pour them into a drain unless instructed to do so. Properly discard this product when it is expired or no longer needed. Consult your pharmacist or local waste disposal company for more details about how to safely discard your product. Information last revised October 2010. Copyright(c) 2010 First Databank, Inc.